In the original Mary Poppins movie, the title character tells a young Michael and Jane Banks, who need to clean their nursery, that, “in every job that must be done, there is an element of fun.” Then, as they sing “A Spoonful of Sugar”, she makes said cleanup look downright whimsical. At Shoobx, we think keeping startup documents and processes organized is lots of fun, but we appreciate that many founders would react to that sentiment in a similar fashion to Michael and Jane. 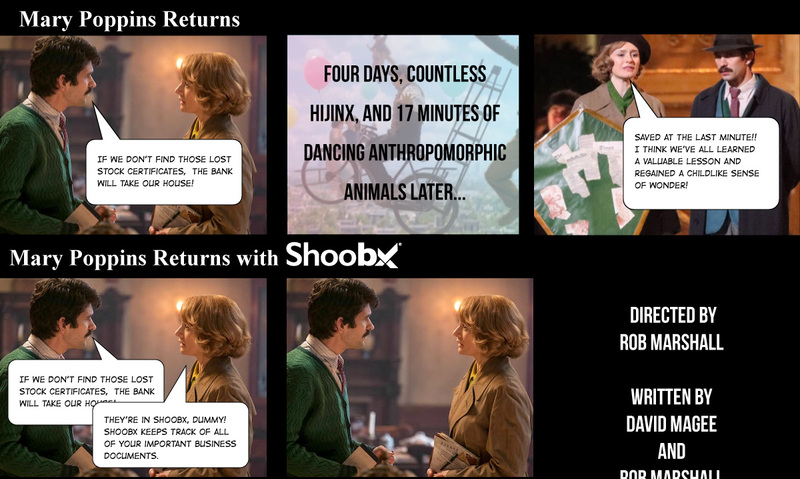 So one might be tempted to say the connections between Mary Poppins and her carpet bag of tricks and Shoobx are flimsy at best—that is, until that person sees Mary Poppins Returns. As the new movie unfolds, we meet a grown Michael Banks, who has three small children, and who sadly lost his wife during the previous year. To cover expenses, he’s given up his work as an artist and become a bank teller at Fidelity Fiduciary Bank, where his father was a partner. He’s also taken out a loan from the bank—a loan whose payments are so far behind that it must be repaid by Friday or the Banks’ home will be repossessed. Michael and Jane remember that their father left them shares in the bank that are valuable enough to cover the loan, but alas, neither can seem to locate the stock certificate, so they have no way to prove they own the shares and pay back the loan. Thus, against the backdrop of Mary Poppins’ magic and joyous dance numbers, the search for the missing stock certificate builds dramatic tension for the beleaguered Banks family. Now, in 1930’s-ish London, it’s safe to assume that paper stock certificates were the norm (okay, if we’re being honest, in 1990’s-ish startup communities all over the US, paper stock certificates were still the norm). But as Michael and Jane’s anxiety makes very clear, paper stock certificates can be tricky. They can get damaged, or worse, destroyed, and even Mary Poppins and her snappy musical numbers can’t make them reappear once they’ve gone missing. So what is a man like Michael (or rather, any startup founder) to do? Use electronic stock certificates instead. As we’ve written, companies have flexibility in how they want to provide their stockholders with evidence of ownership of their shares. Unlike a $20 bill, the stock certificate itself isn’t a valuable item. Rather, it’s evidence that the holder owns the shares referred to by the certificate. As long as a company complies with applicable legal requirements (such as Delaware’s rules stating certificates must include the company name, the number of shares, and bear the signatures of two officers), it’s free to decide that it will only issue electronic stock certificates to its stockholders. So why would anyone do things the old-fashioned, paper way? Well, stock certificates can be pretty, and people like the idea of holding the thing they find valuable. But good news—one can easily print copies of electronic stock certificates (on nice paper with lovely colors no less! )—and the electronic record will still be there for companies and their stockholders to see. In addition, the process of declaring that a company will use electronic stock certificates is a simple one—just a one-time board approval for all the certificates a company will create going forward. Looking to avoid the snafus of the Banks family for your company?